Do you have a question about our video production and animation services? What video services do you offer? We offer a complete range of video production and localization services. We can send a camera crew out to record a talking head or interview, or maybe a new product launch. We then offer all the services you need to edit that into something you can place on your website. Most of our work involves re-version existing videos or presentations. We can convert your presentation into a video and then add a soundtrack. We can translate existing captions and add subtitles in over 80 languages. All this from our studios based in Reading, Berkshire, UK. What video editing software to you use? We primarily edit in Final Cut Pro and Adobe After Effects, but we also have an AVID editing suite and many more programmes that we utilise as required. 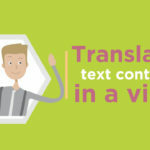 What is involved in Video Translation or Video Localization? So you have a video, in English, with voice-over and some captions. To produce foreign language versions of this video, you will first need a transcript of the sound track. This will need to be translated into the target languages. You will need to either re-voice the video, or add subtitles in your target languages. You will also probably want to translate and replace the English captions. To action this we would ideally need the source files from the original video. This is the project file used in creating the original video, such as Final Cut Pro, Adobe After Effects, Adobe Premier, AVID etc. Without the source files, it is still possible to localise the video, but it will be more difficult, and the translated videos will not be of the same quality as the original. How do you calculate video production and animation costs? Lighting for talking heads/interviews and tie mics. If the music is to be used on several video segments, then a price will be given to cover the entire project. This price does not cover BROADCAST or any RESALE usage. * Cost of camera and operator is dependent on the filming requirements. Expect to pay £350 for talking heads / static shots, and £550 for a more dynamic / creative shoot. ** Optional extra, but advisable when recording sound with more than two people, for broadcast quality, or when recording in motion. *** Suitable for simple video project e.g. Talking Heads, Conferences, Presentations etc. where minimal creative is required. ^ Cost of an external producer is dependent on the subject matter and requirements. ˘ Cost is dependent on the language requirements, and whether a proof-read is required by a 2nd senior linguist.